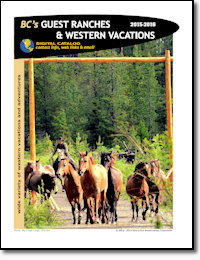 This free travel guide provides information on British Columbia guest ranch vacations and horseback riding adventures. British Columbia Guest Ranches Vacations Guide features cowboys, cattle drives, pack horse trips, trail rides, family holidays and outdoor adventures. All the information you need to plan guest ranch and western vacations in British Columbia, Canada! Right click and use the "save target as" command to save to your hard drive. "If you own or operate a British Columbia travel tourism business and you would like to find out how you can be listed in our family of free downloadable vacation guides, contact us today." A part of the BC Adventure Network. BC's largest travel network.